Benefit Goof Proof Brow Pencil in shade 6 – mini size, worth £9.25. This Works In Transit Camera Close-Up Moisturiser, 20ml worth £15.00. Kebelo Silk Anti Frizz Cream, 15ml worth £5.97. Nuxe Huile Prodigieuse Or Golden Shimmer Oil, 10ml worth £3.80. BellaPierre Cosmetics Cheek & Lip Stain in Pink, full size worth £12.99. MiTi Hair Ties x3, worth £4.95. Elle Magazine, handbag size, worth £4.10. Total value of box – £56.06. Ok so starting with the stand out product here, which is of course the Benefit Goof Proof Pencil. Now I already have this, so I know it’s a fantastic product, and out of the few new Benefit brow products I’ve tried, this was easily my favourite. My only slight niggle here is that I’ve received shade 6 in this box, which is the darkest colour and almost black, so unfortunately it’s not suitable for me. I’m not sure if LookFantastic are giving everyone a shade 6 or if it’s a random selection. I know I’ll be able to give this to one of my friends though who will be very happy to use it! The This Works In Transit Camera Close-Up Moisturiser is a fantastic sounding 3-in-1 product, it promises to even, plump and brighten the skin, whilst acting as a mask, moisturiser and a primer all in one handy tube. The formula contains repairing plant oils as well as caffeine to erase signs of fatigue and make your skin look radiant – I’m looking forward to trying this out. Next the Kebelo Silk Anti Frizz Cream – this is perfect for tackling unruly frizz, and it’s enriched with Quinoa, Amaranth and Chamomile to smooth and revitalise hair. It also contains Argan and Jojoba oil, to leave hair nourished, shiny and silky, as well as a unique heat protector and colour lock shield to protect the hair, whilst still sealing in richness. The Nuxe Huile Prodigieuse Or Golden Shimmer Oil is one of Nuxe’s most famous products – it’s a multi-use dry oil that gives a golden shimmer to your face, body and hair. The oil contains a cocktail of six precious plant oils (borage, St Johnswort, sweet almond, camellia, hazelnut, and macadamia) to nourish, repair and soften face, body and hair, leaving skin velvety soft, and hair supple glossy and full of volume. The BellaPierre Cosmetics Cheek & Lip Stain in Pink is a multi-use stain for cheeks and lips that’s both easily blendable and buildable. The stain can be applied sparingly for a subtle look, or layered for more intense finish, and you can use it as a lip balm, or on the apples of your cheeks for a sheer veil of colour. And lastly the MiTi Hair Ties – this set of three hair ties has been designed specifically to be gentle on hair, leaving no indent, yet staying sturdy throughout the day and providing perfect hold. They’re also ideal for wear during sleep, as the ties are super gentle, reducing head stress for long-lasting comfort. 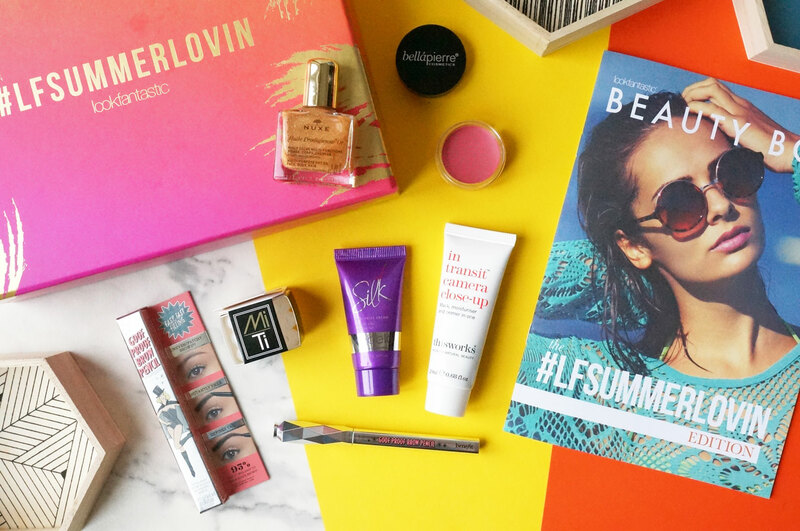 The LookFantastic beauty box costs from £11.25 per box (depending on your subscription preference) and it’s available now at LookFantastic. 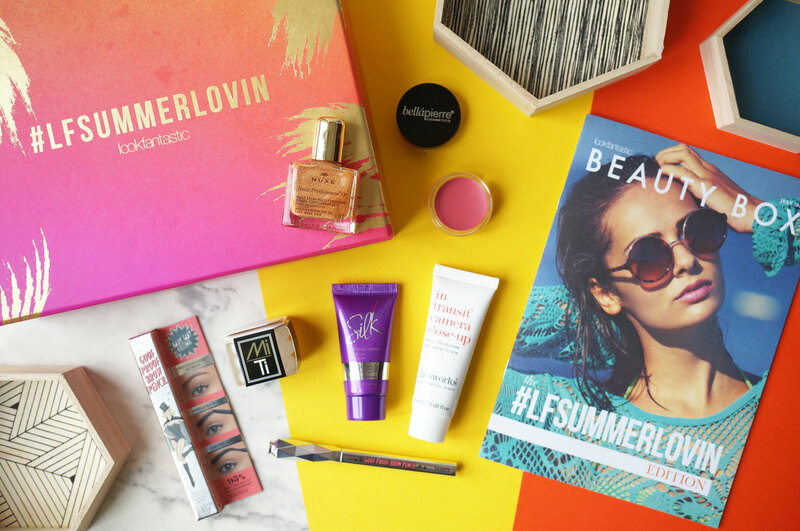 Previous Post Glossybox July 2016 Beauty Box Review + Giveaway! Next Post Happy 10th Birthday Soap & Glory!